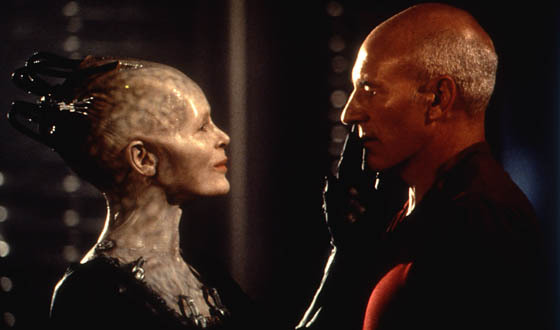 The Borg Queen tells Picard to shush. Best A-Plot: Without question, this goes to the Picard-vs-Borg fight in First Contact. 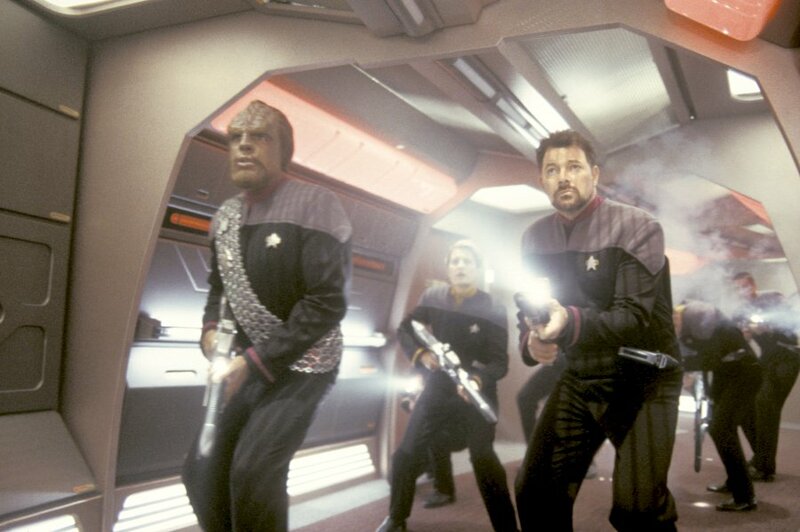 While the stuff on the planet was important to the story, it was Picard taking on the guys who made him completely powerless and unable to stop himself from killing thousands of people that really made the movie compelling. Patrick Stewart threw himself into the Ahab role — it was written into the script, after all — and he completely sold the retcon of the Borg Queen as well as his (justifiable) anger at what was done to him and his desire for revenge. Honorable mention: the need to stop Soran before he destroyed a planet full of innocent people (Generations). Honorable mention: Riker vs the Son’a, mostly because I love a good space battle (Insurrection). This scene still makes no sense, almost ten years later. Biggest Plot Hole: By far this has to go to Generations and the use — and misuse — of the Nexus. I know many others have said this, but it bears repeating: why did Picard specifically need Captain Kirk to stop Soran? Once Guinan told him how to use the Nexus, why didn’t he just go back even further in time, maybe to Amargosa, and apprehend Soran there? Why did he have to come back in the middle of a tense fight scene? It just didn’t make sense. Honorable mention: also in Generations, what was Guinan doing in Picard’s dream house? Did he subconsciously think “Guinan’s probably the only person who can tell me what to do here” and she just appeared? What was her shade doing at the time? And would that shade trust Picard like the real Guinan does? She’d only met him for a couple of days in turn-of-the-20th-century San Francisco, after all. Best Guest Star: How do you not say that William Shatner is the best guest star in the four films? From inadvertently calling Captain Picard a dillweed to the way he immediately began playing off Picard’s “straight man” act, Shatner certainly knows how to play Kirk and how to work within the Star Trek universe — even when it’s 80-something years after his supposed “death”. The whole “meeting of the captains” bit was a bit forced in the script, but Shatner is always going to be Shatner, and that’s what makes him great. Honorable mention: Alice Krige as the Borg Queen, one of the best villains in Trek movie history, right up there with Khan and Chang. Worst Guest Star: I’m sorry, but I just did not get behind Anthony Zerbe as Admiral Dougherty in Insurrection. I know the character was old and the concept of having a fountain of youth for the Federation to use was tempting, but I didn’t have enough knowledge of the character to buy into him setting all of this mess up with the Son’a and involving them at the level that he did. I would’ve needed an episode specifically about this guy just to understand what brought him to the point he’d reached. I know a lot of that is writing, and Zerbe didn’t do too terribly, but there were still several places where I think he could’ve improved. Honorable mention: James Cromwell in First Contact, in my opinion, wasn’t a great casting choice. Cromwell is certainly a good actor, but I think he was too old and too much of a stunt-casting choice to really pull it off. Someone less-known might have been better. Biggest Missed Opportunity: Y’know, after spending all that time on Data’s emotions in Generations and First Contact, why did we go back to the old Data in the latter two films? I know it’s probably because emotionless, wants-to-be human Data was the character we all fell in love with and giving him emotions made him easier to write for, but if there was any chance of that happening, then why didn’t Data just destroy the chip at the end of First Contact? It made him almost join the Borg Queen, made him almost willing to end human history from 2063 onward; it would’ve been within the realm of possibility that Data would destroy the chip. And even though he didn’t have the chip, he had memories of having emotions, right? It should’ve helped him understand more about what was going on in Insurrection, and it would’ve given even more poignancy to “good-bye” in Nemesis. When I discussed the film with my dad, we agreed that Data doing that, without any emotion chip or programming changes, indicated that he really had evolved as a being*. The very existence of the emotion chip, though, took away some of that poignancy. Are they on Deck 24? 26? 29? Lower? Who knows? * Not in those exact words.